NEW YORK • LeBron James spent much of Tuesday evening dropping hints to the Los Angeles Lakers' board that the team need big-name additions and it was easy to see why after their 115-110 National Basketball Association (NBA) loss to the Brooklyn Nets. The 14-time All-Star led all scorers with 36 points, but his supporting cast failed to match his efforts, with only Lonzo Ball (23) and Kyle Kuzma (22) getting into double figures at the Barclays Centre. On the other hand, the Nets played more like a team - with six Brooklyn players finishing in double digits as the home side completed a sixth straight victory to improve to 14-18, while the visitors dropped to 18-13. D'Angelo Russell paced Brooklyn with 22 points and added 13 assists, producing a double-double to gain a measure of revenge over his former team that had selected him as the second overall pick in the 2015 NBA Draft, only to trade him two years later. 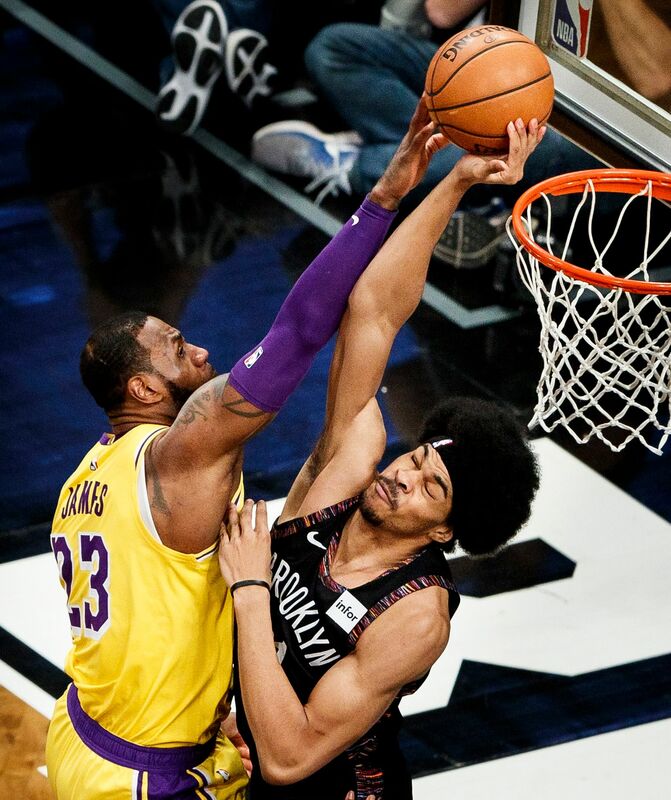 To add insult to injury, Jarrett Allen's first-quarter block on a James' dunk attempt set social media abuzz as he became just the eighth player to deny him. According to ESPN Stats & Information, it was only the ninth time in 1,850 attempts the rim had been protected when the forward tried a dunk, and Allen was thrilled to be "on the list forever now". James, however, dismissed the centre's feat, saying it was owing to their age gap as "he's in his 20s, I'm in my 30s and it takes me a little longer to get warmed up". He also reiterated his desire to see the Houston Rockets' Carmelo Anthony join the Lakers. The Rockets have "parted ways" with the 10-time All-Star although officially, he still remains on their roster, and the close friends were spotted in New York having dinner together prior to the game. The 33-year-old told reporters: "There are obviously things that need to be worked out on both sides. "But I've always wanted to play with Melo, and if the opportunity presents itself, it'll be great. So we'll see what happens." His lobbying for New Orleans Pelicans' centre Anthony Davis also had tongues wagging, with James calling the prospect of the five-time All-Star joining forces as "amazing and incredible". While Anthony would be a far easier deal to work out given that Davis - who is averaging 28 points this term - is under contract with the Pelicans for US$27.1 million (S$37.1 million) next season, James knows the Lakers' roster needs strengthening if they are to become championship contenders. Reflecting on their defeat, with Brooklyn's bench outscoring the Lakers 48-18, he told CBS Sports: "In the wild, wild West (Conference), every game counts, every game matters. "You can't key in on one guy (of the Nets). They can all make plays."